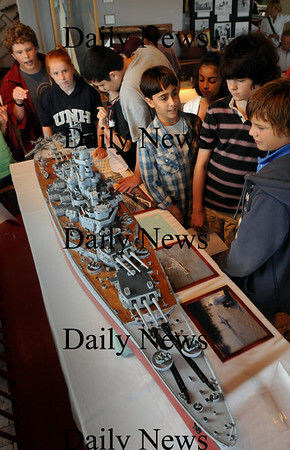 Newburyport: Nock Middle School eighth-grader and docent Dylan Wack, back left, explains the model of the USS Massachusetts at the Custom House Maritime Museum on Thursday to seventh grade students. He's a member of the World War II Club which meets after school and took the entire seventh grade to the museum to learn about era ships. Bryan Eaton/Staff Photo Newburyport News Thursday September 10, 2009.